NOTE: This guest post was written by Morgan McMichen. Morgan is a graduate student at the Seton Hall School of Diplomacy and International Relations. Her specializations are in International Organizations and Global Negotiations and Conflict Management. Morgan’s interests are the function of international institutions in a global society and negotiation as a means of deterring conflict among multinational actors. Last Tuesday, Seton Hall students of Diplomacy and International Relations gathered to watch the US Commander in Chief address the international community at the United Nations. President Trump’s speech at the UN was nothing short of an incoherent spew that was unsuccessfully passed off as a profound declaration. To be fair, there were moments of coherency and even a few moments of presidential rhetoric, yet put all together, mixed with blatant nationalism and direct threats, it created a soup of contradictions that left everyone’s jaws on the floor. Having begun his speech with condolences toward those affected by the recent hurricanes, one might expect that he would address climate change that made the hurricanes all the more destructive. However, there was no mention of climate change, the Paris Agreement, or any other number of issues that a US President would typically address. Instead, he followed his opening statement by praising the United States and its unusual growth since his presidency to an unimpressed global community. Throughout the rest of the speech we heard the repetition of the words “sovereignty, security, and prosperity” in addition to “calling out” specific countries and even delivering warnings. Disappointingly, every moment of commendable presidential rhetoric, such as the promotion of peace in the world, was soon contradicted by his classic outlandish flex of power. As a student of diplomacy, I found myself at times smirking, laying my head in my hands, and even outright cringing. In an organization such as the UN where the promotion of peace is at the forefront, a world leader should not be touting their military power, capacity for demolition, and the hundreds of billions of dollars being spent to make it even stronger. The UNGA is not the place or time to arrogantly publicize ones possession of instruments of destruction that cause deeper suffering and peril in the world. In fact, the UN promotes the exact opposite of war as the organization was built out of the ashes of both World War I and World War II to prevent a third world war. Thus far, it has been successful. Which brings me to the next point of Trump saying that the US does not benefit from the UN. I think all can agree that not suffering a third world war is beneficial to everyone on this planet, especially with the capability of nuclear weapons and the aftermath of such an atrocity. That is but one example of how the US benefits from the world being safer and more secure with the help of the UN. I agree with him that the UN is in dire need of reform, in many regards, one being that countries “pull their weight” when it comes to “footing the bill.” But a world without the organization altogether is not world I’d ever want to imagine. I had high hopes for our president at the General Assembly. It would have been a great chance to show the international community that the US is still an influential, rational, and strong leader in the world. But many of his words echoed division, pointing the finger, and flex of power. All of the great statements he made were undermined by inconsistencies and unprecedented “throwing down of the gauntlet”. Perhaps the loudest gasps occurred when Trump threatened to “totally destroy North Korea.” Let us not forget that United Nations is the largest and single most important organization founded upon peaceful cooperation. It has been able to not only bring, but keep 193 countries “at the table”. Thus far, it has successfully contributed to the prevention of a third world war. It was disheartening to hear the leader of the free world, with his threats of annihilation, seemingly trying to start World War III. 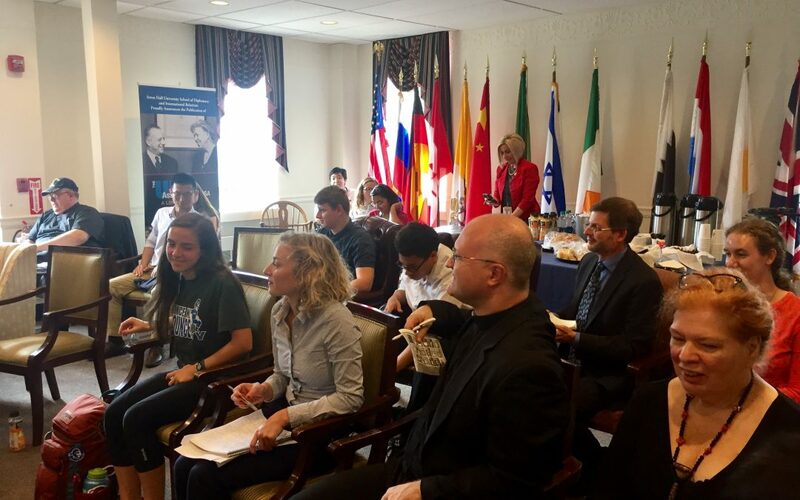 Click here to watch additional reactions of Seton Hall diplomacy students and staff. Thank you, professor. And these Op-Eds make great points, because, I too, recognized some of the conventionality and “presidential-like” statements that he made. However, something very different stood out to me. When I watched his speech, I was many times very impressed and absolutely surprised at the presidential rhetoric being used. My dismay lies in the fact that for every great statement made, it seemed there were two or more contradictory statements that followed. For every stride he took, he took a leap backward. For me, the inconsistency is what made all of the positive points become irrelevant. I couldn’t take what he was saying seriously or hold it with any credibility as he seemed to just spout off something that is the total opposite of his previous statement. As always, it is clear when he is reciting the parts that were written for him, and the parts he came up with himself. They don’t always flow because they don’t necessarily capture the same idea. He has made his opinions known and is not afraid to do so. I guess I hoped that he would be more consistent and sincere no matter the position he took so that we could actually believe what he was saying. And for any US president, lets not come to an organization that we helped found and preach notions of destroying other nations. Leading by example is a much better look for us than stooping to other’s levels. One might be impressed to learn that President Trump’s speech in fact was very much the same as stated by previous US Presidents’ on North Korea in addressing the UN. This is the shown in the following OpEds of the Heritage Foundation, the Washington Post (veteran columnist David Ignatius) and Politico (Jamie Rubin, Secretary Albright’s chief of public affairs at the UN and at State Dep’t). It is rare for these three to come to a similar point of view, but there it is, with healthy references to the historical record.